Veteran high school theatre teacher Michael Moore wrote these scenes to assist classroom theatre teachers in developing their students’ acting skills. There are no cuttings here — each one-minute scene is complete with a beginning, middle, and end. To simplify the time-consuming process of finding the perfect piece, each scene is titled with a particular personality trait, emotion, or situation that it highlights or explores. Some of the scenes are dramatic, but most are comic since that seems to appeal the most to young performers. The book of duo scenes is divided equally into four sections: gender neutral, male and female, male only, and female only. Read more...This variety should provide young actors ample opportunities to develop and exhibit their memorization and acting skills. 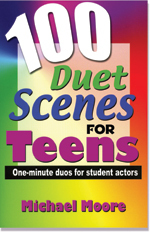 These easily staged duet scenes with believable characters in a wide variety of topics are excellent for contests or simply for acting practice. Concise, incisive, and very funny! These professional-level satirical dialogs are an actor’s delight. These royalty-free scenes provide a perfect way to practice important comedic skills like timing, characterization, and physical comedy.